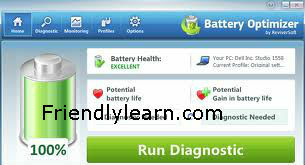 Extended Laptop Battery Life - Through advanced diagnostics, Battery Optimizer can help you increase your battery life. Battery Usage Warnings - You can set up Battery Optimizer to warn you when you battery usage increases to a certain level. Easy To Use - Optimizing you battery life is quick and easy with intelligent profiles for quick settings changes. Unrivalled Technology - No one else offers the advanced features that Battery Optimizer can offer.